The Club started differently for many people. Dot and Derek Bridgehouse were at the Peterborough Show in May 2000 when the van door was pushed open and Rex Wade appeared and said “Hobby meeting at my place in June/July, send you details”. For Tony Charity and Denis Kearns they received a letter asking if they wished to participate in starting a Club for the Hobby Owners. From 7th to 11th July, 2000 the club had its first rally and AGM at Rex and Joan’s farm near Ruthin North Wales. Everyone was advised to meet at the Centre Car Park in the Clocaenog Forest and wait for someone to take them in as everyone was advised they would not find it on their own. Each was briefed on the pot holes, bends, inclines etc including the ford. When someone says “follow me”, you do, and right away wonder if you should have. There were twelve 750 Hobbys, two 600 Hobbys and a Swift sited. During the meeting the ford rose from a trickle of three inch to a raging fourteen inch. Although a very enjoyable meeting, it was one some will never forget in their brand new vans. The Committee was formed, but the Club remained on the lookout for a Sugar Daddy, a rich Uncle and a member who owned a Channel Crossing Ferry! The Club was called the Independent Association of Hobbyists (IAH). The reason for this was that it was Rex’s experience that being independent from any large Camper Organisation, or franchise, released us from any influences that may contradict our ethos. The IAH chose the Hobby Bird as its motif. Being a small Falcon and a British bird it is a superb aerialist that even the Swifts cannot escape. The IAH went from strength to strength; wives came up with some fun ideas to raise funds for insurance etc to cover our humble beginnings. At one point we had 80 vans on our membership. 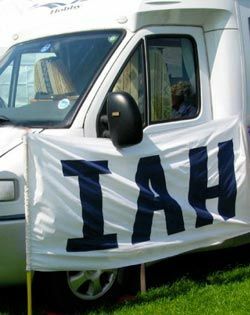 The IAH held rallies around the country, mainly organised by members in the area that they lived. 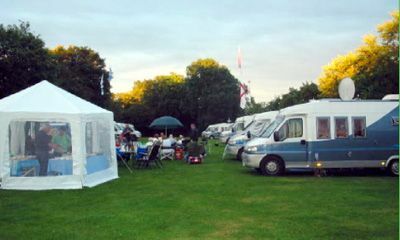 As with many Clubs, people joined to gain experience from others about their Hobby Motorhome, and as always some members proved very talented and was able to help with other’s problems. The IAH started with a Newsletter consisting of two sides to an A4 sheet of paper, and a Technical Officer came on board to correlate any Technical information. Tony Charity started a very basic Web Site. The Newsletter grew in popularity especially with Denis Kearns as a brilliant News Editor. But no matter how good, the Editor relied on information from members which has always been a weak point. The IAH had to change with the times and Ken Cookson took over as the Website Officer and took it to another level. It proved for the good as the Newsletter became too expensive to print and send out with stamps at a premium cost. Advantage was taken of the website and the Editor put the Newsletter on the website saving a small fortune. Resistance was met at first as people preferred a paper copy but sense prevailed. In 2014 the website has now been passed to an external company and the position of a Moderator formed to vet all articles for the site. The site will now allow tablets, mobiles and contents to be submitted more easily. The Newsletter and Technical Officer have been dispensed with because of the facilities available. The use of the Members Forum enables everyone to keep in touch and be informed. There have been too numerous rallies to list but it has varied from Dusseldorf, Guernsey, Scotland and Spain, but everyone has memories to offer from each one, no more so than Mr Flash (Ed Watson) who has built up a portfolio of pictures to remind us all of our past adventures. The Hobby Factory has now stopped producing the tag axle and is producing a very modern version now. There is such a variety of choice out there, but our Hobby Members have remained with us even after changing their motorhome. We continue to be an association that is for fun and recreation and so that we may continue to exchange ideas and help each other with any technical problems and meet up on a regular basis at venues throughout Britain and abroad. It is for everyone to give an input and not just the few.